This interview was originally published in the October 2018 issue of New African, to coincide with the sixth edition of 1-54 London. 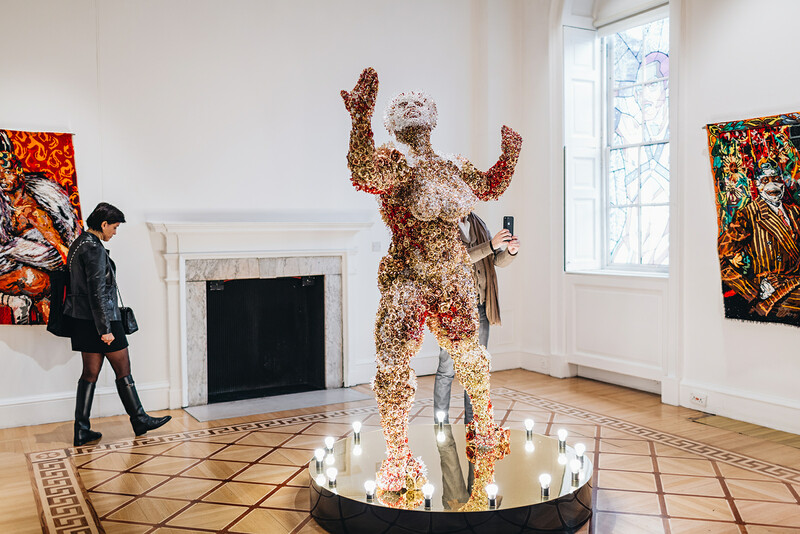 Opening his first solo exhibition in the UK at Somerset House in occasion of the sixth London edition of 1-54, South African artist Athi-Patra Ruga brings a selection of new and old works. In interview with 1-54, he discusses his practice and how his work tackles current social and political issues in South Africa through humour, utopian realities, bold colours and performance. 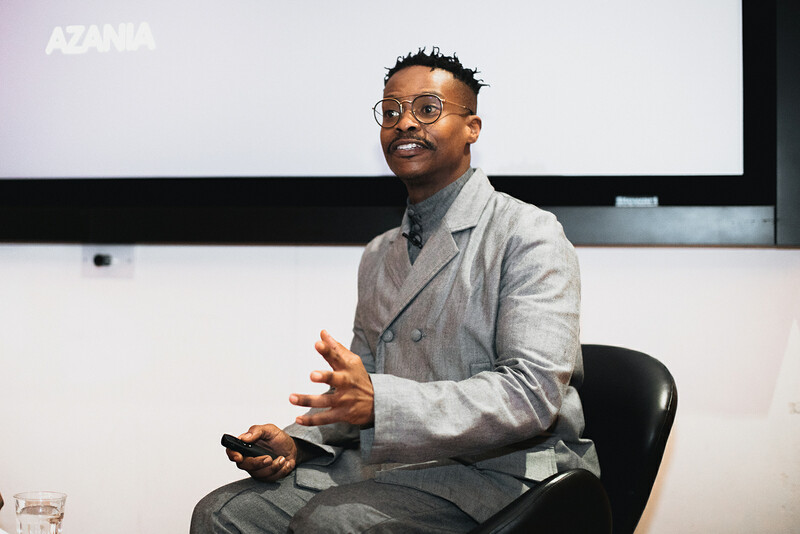 Athi-Patra Ruga’s exhibition runs until the 6 January 2019 at Somerset House’s Terrace Rooms. You work with multiple media, from photography to video, performance and tapestry. Can you tell us more about your creative process? I started making art in 2006 through performance, costume and petit point. However, the limit of working with performance is that only a small amount of people can see it; that’s why I started working with photography and video, which are able to travel digitally and reach broader audiences. I’m a performer, I’m love with my audience and I love to please them and my media serves these purposes. I present the toughest conversations and questions in the most beautiful way with colour and humour. My work is about telling better stories, better stories about our histories and our role in art — when I say ‘our’ I mean: black, gay, femme and queer — because these are stories that have often been omitted by a hyper-masculine, European art context and it’s exactly what I’m trying to convey my upcoming show Of Gods, Rainbows and Omissions. Your work refers a lot to the notion of identity and its construct, why are you interested in this? I was raised to believe in the idea of Nelson Mandela’s ‘rainbow nation’, where everything will be great; unfortunately growing up you realise that there is no rainbow nation – here in South Africa we are still very much racially divided, there’s the biggest gap between rich and poor and the violence against women and queer people is higher than ever. I’m interested in disrupting the construct of these ideas. With my work I tell new stories and construct new identities in which we can find something that represents us. 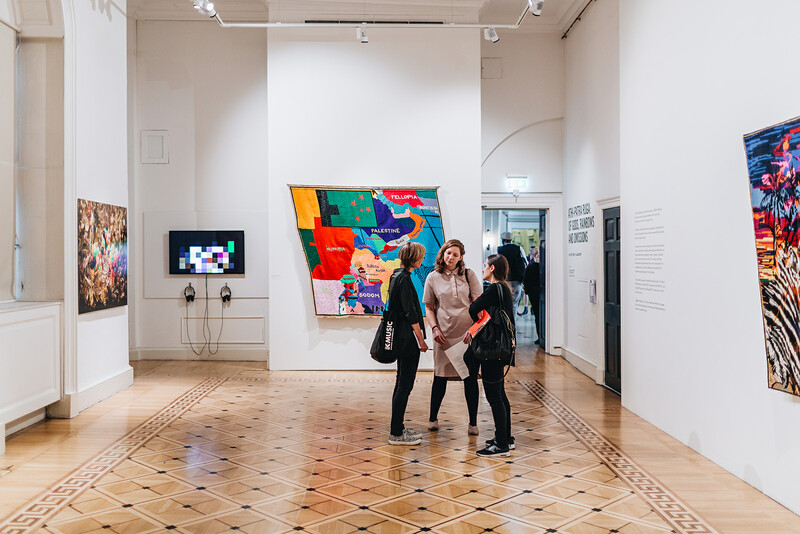 Your upcoming exhibition at Somerset House will bring together three bodies of work: ‘The Future White Women of Azania’, ‘Queens in Exile’ and ‘The Beatification of Feral Benga’. Can you please briefly explain how these works engage with each other? The show begins with The Future White Women of Azania (2010 – 2016), which is an interrogation on the contradictions of the post-colonial, where we are re-finding a nation and waiting for a messiah. In the second room, Queens in Exile (2014 – present), all the avatars created in the previous series are killed and I explore the concept of exile. Exile is at the core of my practice and I refer to both physical exile and its derived cultural exile, looking at how some stories are lost and new ones are formed. For the last part of the exhibition, I present The Beatification of Feral Benga in which I investigate what is connected to exile: in exile we forget things. I want to pay homage to all those first black people we forgot, to those who came as stars like Josephine Baker and Feral Benga. With this series I am reaching out to Feral Benga and asking him, as an ancestor, to come and protect us. I want everyone who enters this room to reflect and remember the bodies and artists and came before us. Utopia and mythical realities are at the core of your practice, how do these comment on South Africa’s history and present? I use history to objectively go to issues that are still affecting us today and I tackle them by using fantasy, humour utopia and imagination. I was born in 1984 and I was raised to look forward to Azania, to the rainbow nation where everything will be okay, but then I grew up to see that not much has changed. Two events betrayed the Mandela magic to me: the miniskirt attack in 2008 and the xenophobic attacks, where South African nationals were persecuting other South African nationals. These were not only a national trauma but also an artistic trauma for me. At that point I realised that I could only heal by giving a double take to all the stories that I grew up with, all the over-nationalistic stories, all the rainbow nation’s stories and the ones about us evicting the white man, which are not true because we are still not free today: our women are not free, gays are not free and ultimately our imagination is not free. With my work I want to create new mythologies and stories to disrupt the body national, I want to disrupt elements of taste, especially when taste is used nationalistically, like with Afrochic or Afro-futurism, from which I distance myself. 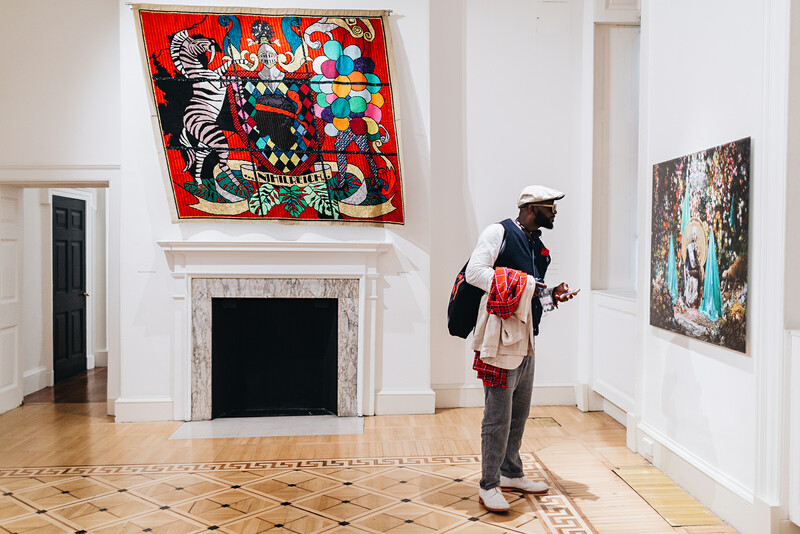 The show at Somerset House will be your first solo exhibition in the UK, are you expecting the public in London to receive your works differently than your audience in South Africa? I have exhibited in Europe since I was 23 so my work is not new to this audience. I want the visitors of the show to rise to the occasion and I want them to experience my work and respond in their own way. I’ve put a lot of mental labour to make my works and I want the audience to do the same. Your works have been exhibited at 1-54 at many editions and you are now collaborating with the fair on an even greater level with your upcoming show. What makes a platform like 1-54 interesting for contemporary artists based on the continent? Differently from past generations, artists like myself are the first ones to actually live from making art. The commercial exchange that happens in fairs like 1-54 has put me in a favourable position, where my studio can grow and give back to my community, for example I can now provide scholarships and bursary funds for girls to go to school. It’s because of international art fairs focused on African art that artists like myself have the chance to keep producing work and grow internationally.